The School of Health and Life Sciences hosted the Public Health and Informatics Symposium at the Doon campus on Friday, April 5. Student poster presentations were part of the Public Health and Informatics Symposium held at the Doon campus on April 5. The event welcomed Conestoga students and employees, parents, Program Advisory Committee members and community partners for a full-day of activities that showcased a broad range of projects completed by students in the Bachelor of Applied Health Information Science and Bachelor of Environmental Public Health degree programs. Monk also welcomed keynote speaker Jason Garay, vice president of analytics and informatics at Cancer Care Ontario, who presented his views on the future of public health surveillance and disease detection through analytics and technology. 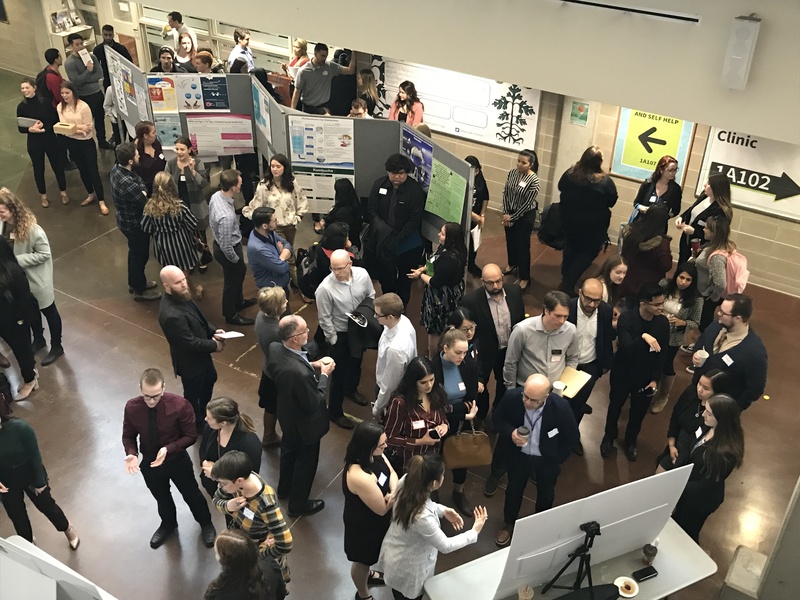 Symposium activities included student poster presentations, an innovators contest, networking opportunities and a virtual reality demonstration. The new VARLab at Conestoga specializes in creating unique training solutions for industry partners, developing new academic learning experiences, and exploring new technology and trends in virtual and augmented reality. The lab was initiated last summer and has been used by students to conduct virtual public health inspections. During an awards presentation to honour student achievement and excellence, Bachelor of Environmental Public Health student Emily Gillies was presented with the Abell Top Research Project Award that includes a $1,000 prize. Students Gurjot Dhaliwal, Lindsay Gray, Katelynne Moors and Jasmine Kaler received a $1,000 award, sponsored by Information Builders, for presenting the best health informatics dashboard based on well water data from Wellington-Dufferin-Guelph Public Health. The Public Health Agency of Canada and Information Builders were recognized for their support as industry partners. Visit the School of Health and Life Sciences and Community Services for more information about the Bachelor of Environmental Public Health and Bachelor of Applied Health Information Science degree programs.